Lead the pack and set the pace with this powerful theme; perfect for any business that is serious about getting ahead.Click here to visit imPower. Leadership Boot Camp Unique product! This 17-Module Self-Directed Leadership Course includes high quality Podcasts, Powerpoint Slides, Printables, Action Challenge and more.Click Here! Great leaders aren’t just born great—they become great with the right tools and resources. A new addition to the Reproducible Training Library, Leadership 101 is a classroom training program, e-learning resource, and e-book that provides skill development and refinement. From discovering how to build trust and confidence with employees to learning how to promote teamwork and act decisively, it’s both an excellent starting point for new leaders, and a back-to-basics refresher for more experienced leaders. Great leaders aren't just born that way, they must learn how to lead through experience, mentoring, and training. Leadership 101 provides leaders at all levels with the skills they need to improve organizational performance. Available in 3 separate versions as a classroom training program, e-learning program, and e-book, Leadership 101 is part of the Reproducible Training Library, a full suite of unlimited-use content that’s downloadable, customizable, and reproducible. Effective leadership at every level, from supervisors and managers to top executives, is a key characteristic of winning, resilient organizations. Without skillful leaders, an enterprise struggles even in good times, fails to adapt to change, and buckles in the face of adversity. The question is, how to develop those effective leaders? An essential first step in any training effort is to help them gain insight into their own behavior and its affect on those they wish to lead. 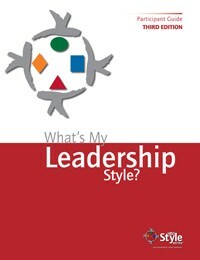 Part of the best-selling HRDQ Style Series, What’s My Leadership Style? is a validated assessment that quickly and accurately identifies a preference for one of four behavioral patterns based on the proven personality theories of William M. Marston and Carl Jung: Direct, Spirited, Considerate, or Systematic. With increased awareness of their personal style and a practical mental framework to build upon, aspiring leaders can assess and adjust their own actions, interpret the behavior of others, and improve their ability to win hearts and minds in any situation calling for effective leadership. The power behind What’s My Leadership Style?, like all assessments in the HRDQ Style Series, lies in a simple but effective model for understanding deep-rooted predispositions in human behavior. Based on the well-researched personality theories of Carl Jung and William Marston, the model identifies two basic dimensions of personal style: Assertiveness and Expressiveness. Assertiveness is the effort a person makes to influence or control the thoughts or actions of others. Expressiveness is the effort that a person makes to control his or her emotions and feelings when relating to others. Combining the two dimensions results in a four-quadrant model with four unique personal styles. Psychologists and test builders have given these styles various names over the years. HRDQ refers to them as: Direct, Spirited, Considerate, and Systematic. The simplicity of the model makes it is easier for you to facilitate and easily remembered by your participants. You will find the model is quickly picked up by learners and integrated back on the job. What’s My Leadership Style? is ideal for training anyone who needs to influence others towards achieving a goal, and appropriate for both new and experienced leaders. The assessment can be used as a standalone training instrument or incorporated into a more comprehensive program. It makes an effective component in training programs for a variety of topics, including leadership, management, and supervisory skills. What’s My Leadership Style? starts with a self assessment that takes leaders approximately 10 minutes to complete. Individuals respond to 20 pairs of leadership actions, assigning a total of 5 points between the two actions. The numbers they assign to each action reflect the degree to which they typically use that action when getting others to work toward goals. Scoring the assessment reveals a Leadership Style Profile and a dominant preference for one or more 4 personal leadership styles: Direct, Spirited, Considerate, and Systematic. If you intend to use What’s My Leadership Style? for classroom training, we recommend you allow approximately 1.5 hours for interpretation of scores, topic discussion debrief, and action planning. The Facilitator Guide includes everything you need to lead a successful training session from comprehensive background information and comparative data, to reproducible handouts, a professional PowerPoint presentation, and an easy-to-follow workshop outline that expands the assessment into a 2-hour program. The Leadership Practices Inventory (LPI) approaches leadership as a measurable and learnable set of behaviors. 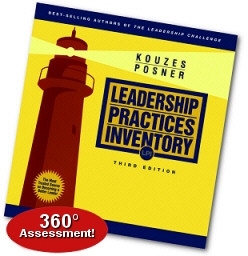 Developed by Jim Kouzes and Barry Posner, this well-known 360-degree assessment tool helps individuals measure their leadership competencies and learn how to apply the Five Practices of Exemplary Leadership to real-life organizational challenges. Understand that effective leadership skills can be learned. Measure leadership competencies. Learn the Five Practices of Exemplary Leadership Model. Discover how to apply practices to organizational challenges.The newly revised LPI offers in-depth, precise results. The Scoring Software produces a detailed Feedback Report for each participant and has the capability to save data for score comparisons over multiple administrations. Designed to be user-friendly, the updated Participant's Workbook quickly takes participants to the heart and soul of their Feedback Report. And the new Leadership Development Planner was created to be used over several months of coaching sessions. Model the Way, Inspire a Shared Vision, Challenge the Process, Enable Others to Act,and Encourage the Heart.Anyone can learn to be an effective leader if they are given the right feedback and tools. Help others to discover their leadership potential with the LPI! Go to HRDQ to get this Leadership Practices Inventory. No two work group situations are necessarily the same. And with so many complex variables to consider, what makes a leader effective? The answer is focus and flexibility. According to the well-known work of Fred Fiedler, “The best style of leadership is determined by the situation in which the leader is working.” The Focused Leader Profile - A Situational Approach to Leading Work Groups, adapts Fiedler’s work to the practical concerns of today’s leaders. By examining three critical factors - relationships, task clarity, and power base - this powerful tool helps leaders narrow their focus, analyze work group situations, and then determine how to respond most effectively. Understand that leadership is situational. Learn the three key factors leaders should use to analyze and respond to work group situations. Identify appropriate task- and/or relationship-focused responses. Develop personalized action steps for responding to a current leadership situation. According to Fred Fiedler and his researchers, all leadership is situational - meaning that a leader should base behavior on the situation in which he or she finds him or herself. Fiedler and his group concluded that each leadership situation needed to be examined from 3 angles. The Profile presents leaders with 8 work situations and 4 possible responses. In scoring the instrument, they generate two profiles - one for Style Effectiveness and one for Leadership Flexibility. Next, leaders are introduced to the 3 Factors of Focused Leadership and then learn how analyze these factors when choosing an effective task/relationship-oriented approach to address work group situations. Interpretation of Profile results and action planning help leaders apply their learning to a current work group situation. To provide further practice in analyzing situations and choosing an effective leadership response, the Facilitator Guide also includes a complete 3-hour workshop. New supervisor/manager training. Use the Profile as a baseline for new managers. Coupled with an explanation of the theory and the Three Factors of a situation, new managers have a foundation for developing and fine-tuning their management skills. Refresher training Use the Profile as a pre/post application. By taking the Profile twice, managers gain a comparison and help in identifying areas of strength and improvement. For many team leaders, leadership can seem like an intangible, unattainable skill — one that's best left to those at the top of the organization. But in reality, leadership takes place at many different levels, from strategic directors to team and project leaders. And the common denominator is a set of key recognizable skills that any leader can learn, practice, and develop. 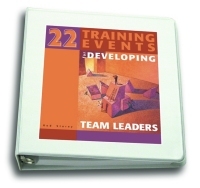 22 Training Events for Developing Team Leaders is a series of exercises, simulations, games, and case studies that addresses the skills at the heart of improving the way team leaders guide their teams. 22 Training Events for Developing Team Leaders is flexible and may be adapted to meet your participants' specific training needs. Build the activities into any team leadership program, tie together several events for a mini training session, or use selected activities as stand-alone exercises. What does it take to increase a person's satisfaction at work? Using the well-known, time-tested model of Maslow's Hierarchy of Human Needs, Achieving Peak Performance provides front-line supervisors and managers at all levels with a simple yet powerful tool for identifying employee needs. Using this information, managers are then able to positively influence employees toward higher performance levels. Maslow's theory offers a very practical way of looking at motivation issues for individuals or teams. This approach makes good business sense: provide employees with goals they find meaningful and engage them in activities that satisfy their individual needs, and they will naturally feel motivated to perform at higher level. Available in both Employee and Manager Versions, the Employee Version is aimed at increasing an employee's awareness of their individual needs. The Manager Version is designed to identify employee needs in an effort to motivate higher levels of performance. To provide the most powerful learning experience, we recommend using the Employee and Manager Versions in tandem. Achieving Peak Performance can also be used individually as a self-paced learning tool. Either way, your employees will experience greater job satisfaction and improved on-the-job performance. The Employee Version includes the self-assessment, FAQ, and action planning. The Manager Version and facilitator guide includes discussion guidelines and sample dialogs, FAQ, action planning, sample training design, case studies, transparency masters, and more. The Workbook's self-scored assessment allows individuals to produce their own profile on the spot, and then shows them how their self-profile compares with other leaders. It also includes questions to help them evaluate the implications of their strengths and weaknesses and how to use that information to develop their own action plan for improvement. Understand the major components of leadership. Identify the characteristics of a successful leader. Evaluate one’s leadership strengths and weaknesses by comparing one’s results to "good" and "poor" leaders. Develop a personal action plan for improving leadership skills and abilities. The Campbell Leadership Descriptor is perfect for leadership development seminars, classroom discussions, and one-on-one coaching. The Facilitator's Guide Package offers everything you need to prepare for and conduct a leadership workshop, including instructions for scoring and interpreting the Descriptor, a sample of a completed Descriptor, a step-by-step facilitator’s "script," master copies of overhead transparencies, illustrative case studies, a list of recommended books, and more. In the book and movie, The Richest Man in Town, the main character, Marty Martinson, leads not with his job title but with his heart. Check out the sample content below and share this unforgettable movie and story on your website, blog, in your newsletter and with family and friends. Perfect time of the year to celebrate leadership as we approach the July 4th holiday and celebrate all the leaders and the community of people who worked for freedom. 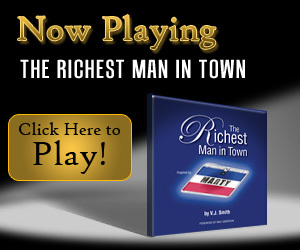 “The Richest Man in Town” movie is all about leading with your heart and a service attitude. It may make you laugh, cry or both. Enjoy this 3 minute movie that may also cause you to pause to reflect on life. Most people think the term “legacy” is something you leave behind when you’re gone. But what if you were living your legacy now? What if your vision for the future was evident in everything you do, every day? Welcome to Legacy Leadership, a philosophy, model, and proven process for bringing out individuals’ best, developing other leaders in the organization, establishing leadership culture, and positively impacting the bottom line. In a nutshell, it’s about building the foundation for real-time legacy in today’s organizations. What makes Legacy Leadership different from other programs is that it offers a compelling set of leadership practices that are designed to perpetuate a cycle of leadership development. It delivers a comprehensive framework of practices, behaviors, attitudes, and values that address every aspect of successful leadership – regardless of industry, experience, or organizational role. Understand that legacy is created by leaders, who in turn develop other leaders. Learn The 5 Best Practices Model and the associated 10 Critical Success Skills. Top 3 strengths and challenges in each of the 5 Best Practices. How to shift one’s thinking to serve other’s first, then oneself. Develop an action plan for becoming a Legacy Leader How it Works. Legacy Leadership that offers comprehensive learning tools for both the individual and the facilitator, including an online self assessment, an online 360 assessment, and a one-day workshop. Combining the results of the learning instrument together with relevant personal experiences and the instructor-led program, individuals are well equipped to formulate an actionable development plan for becoming a Legacy Leader. Dr. Jeannine Sandstrom and Dr. Lee Smith Drs. Sandstrom and Smith are the co-developers of the Legacy Leadership™ platform of leadership development materials and co-authors of their recent book, Legacy Leadership: The Leader’s Guide to Lasting Greatness. Dr. Jeannine Sandstrom Dr. Jeanine Sandstrom, Master Certified Coach and CEO of CoachWorks International, is a globally experienced Executive Coach who partners with C-Suite executives to optimize leadership performance. As a proponent of life-long learning, she believes in constant training and conditioning to be prepared for life’s decisive moments and biggest opportunities. Jeannine employs expert leadership training methodology to condition executives to perform at the top of their game. She advises on complex strategic matters and partners with leaders in taking concrete actions for immediate results. This approach encourages timely breakthroughs, improved performance and bottom line results. Dr. Lee Smith Dr. Lee Smith is a highly experienced Executive Leader Coach working with C-level leaders and their executive teams. She has a proven record in coaching and developing leaders in realizing solutions to critical executive issues, addressing change and delivering results. In her work, Lee serves as the coach, leader, strategic change agent, teacher, encourager and trusted advisor. As President of CoachWorks® International, her clients include Fortune 500 companies and other organizations and non-profits. Lee holds one of the first international certifications as Master Certified Coach. Her doctorate is in Organizational Behavior and Psychology with an undergrad in Business. She has authored books, coaching programs, and assisted in establishing standards/ethics for the coaching profession. Leagcy Leadership: The five best practices are based upon the "being " and " doing " of leadership.